Would you wrap your caravan or motorhome with a designer vinyl? Bored of your caravan or motorhome graphics or white side panels? Want to make your vehicle stand out from the crowd when on the road or pitched up? Or maybe you’d like to add a bit of a personal touch to your tourer or motorhome? Vinyl wrapping allows you to personalise your vehicle any way you like it and you can make it as personal or wacky as you dare to go! Lunar Caravans recently partnered up with British designer brand Joules to create a one-off touring caravan, wrapped with birds, butterflies and florals. Or you could simply add some personal or company branding to your ‘van like blogger Deb Ludford did to promote her website In Pursuit of a Dream. A full vinyl wrap of your caravan or motorhome could even help to protect your vehicle’s paintwork from chips and scratches. To give you a taste of what you could do to really jazz up your touring wheels, our in-house designer has created a few funky designs. We have a landscape caravan wrap…. If Caravan Guard did caravan wrapping it could look like this! And finally, here’s a Formula One inspired motorhome wrap! Would vinyl vehicle wrapping affect my caravan or motorhome insurance? At Caravan Guard we’d want to be told about such a modification and for the cost of the wrapping to be included in your caravan or motorhome sums insured, but then our usual cover would apply. We’d love to know what you think about our designs and to vote in our latest community poll. 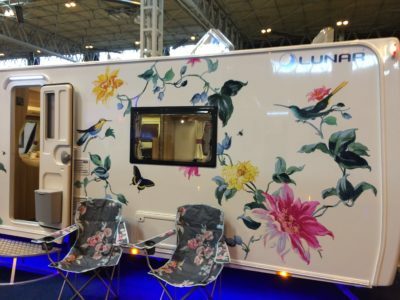 Tell us if you’d consider wrapping your caravan or motorhome with a designer vinyl? Would you wrap your caravan or motorhome in designer vinyl? As always, feel free to add you thoughts and comments in the box below. I have had the front of my caravan wrapped with clear paint protection film to prevent stone chips as my X5 M-sport could not be supplied with mud flaps and my Hymer Nova only has one awning channel, the latter ruled out fitting a front cover. I wouldn’t wrap my caravan, however, I do have a vinyl picture above the name, i.e Pegasus. The horse that is. I had my Pilote motorhome wrapped silver with custom graphics from new. The cab was already silver, but the rear body was white which I didn’t like. I think the whole design looks great and was exactly what I wanted, it certainly draws attention and comments everywhere it goes. The total cost was fairly reasonable at £3k, certainly when considered against the price of the new motorhome. I can share pictures of the before and after – how can I post them up? Yes definitely, make the whole thing silver, or an F1 design. Make heads turn. My old motorhome would be rejuvenated. I think it would be great if you van was ever stolen. A unique design would make tracking it a bit easier…’Anyone seen a caravan with Zebras on?’ would make it noticeable. But personally, I would only like something delicate, like a few flowers or something, but as we have an old Avondale Avocet I always find it easy in a crowd as it’s a cream caravan, not a white one. Ah maybe the wrap should have an Avocet on it? My comment of 27th March is still awaiting moderation?? I’ve emailed you directly Alice, as I didn’t understand your initial comment. I would certainly consider putting graphics onto my motorhome as like people say above, it brightens up life! The only problem can be devaluing your vehicle? Graphics or vinyl stickers if left on for a few years can leave visible evidence when removed, so I think it should be thought about carefully before taking the plunge. Full wrap sounds good and could even make you vehicle blend into its surroundings, but if it is scuffed it can spoil the whole effect..:( – it is also VERY expensive…. We have a duck which sits waving it’s wings on the dashboard – it never fails to bring a smile to passers by! I doubt if I’d wrap my whole vehicle, though I am considering putting something unique on the outside to make my motor home more singular. This would include an Egyptian type writing around the middle or perhaps even different designs on each side. Most units look too similar and it’s very likely each one will not be easy to discover in a group of such vehicles, making the need to find any particular one rather difficult to undertake. How about making a flag instead? Always rather fun and probably cheeper. A flag would be cheaper and are a great way of identifying your ‘van when pitched up. The Egyptian writing sounds good though. We are considering it, why not bring a smile to people, the brighter the better, a danger on the road get real !!!! An interesting (if very expensive) idea, it probably falls into the same category as cherished/personal number plates. Some love ’em, some hate ’em ! I would love the dark Side of the Moon prism on both sides of my Motorhome. Wow have been thinking of a way to cheer ” Sanna ll ” ( Dutch for Sun ) up would like small flowers …or exotic birds bird of paradise flying over the front or door. Why are they block white any way? If I was advertising would I be getting payment weekly. Thanks for the offer. It was just a design idea and not something we are planning on doing. Would brighten up a boring white caravan and might make a caravan thief think twice about stealing it. We wrapped the front end cos it was cheaper than a front end respray, Pilote, lots of different whites anyway! I’ve had custom writing on both my previous caravans which have drawn a lot of admirers both at home and the continent, both my wife and I believe it better than looking a big white space on the rear and ads a little humour to those following. Hi Dave, one man’s meat as the saying goes. I think it is really good and shows the imagination of the owner, a little crazy or just dull. I would love to wrap my caravan… so funky…. and how ridiculous to think that they would cause accidents…. we all pass billboards, odd looking cars and scenic views whilst driving… whats the difference? I really thought about wrapping my little Freedom caravan because I’m not keen and don’t understand why they’re all white! The only drawback is the wrap is only guaranteed for about 6 years. Some of the ‘full wraps’ would look great on-site, but would be disorientating for others on the road, increasing the risk of accident. Interesting idea especially with the same news letter contained a piece on the use of mobile devices when driving. Distractions should be kept to a minimum whilst driving so no I wouldn’t vinyl wrap my caravan. Hi Malcolm, we’ve tried to get some costings for you but it’s very difficult to give you an estimate as there are so many variables to consider, including the type of vinyl used to wrap your motorhome, and how much wrapping you are considering. Costs can vary so much. We’d suggest you speak to a professional vehicle wrap specialist, who uses materials such as 3M, Avery or Hexis. We found Richard at Staffordshire Signs and Graphics very helpful. Already got mine done, on the bonnet ‘Scott Free’ looks awesome but people want to know where I hired it from! Sorry about that Michael. We’ll take a look to make sure everything is working. It’s not the people who wrap their vans who have to look at them! a good idea i have been thinking about such a thing, i think it would brighten up a camp site and shrug off some of the old fuddy duddy image of caravaning. Hi Daphne, vinyl wrapping a vehicle uses a very different high quality material to the cheap and cheerful graphics used to brighten up a wheelie bin. A clear laminate also goes on top of the vinyl. offering protection from UV light and slowing down the sunlight fading process. Plus a motorhome or caravan is less likely to be stood in the same spot in the direct sunlight.